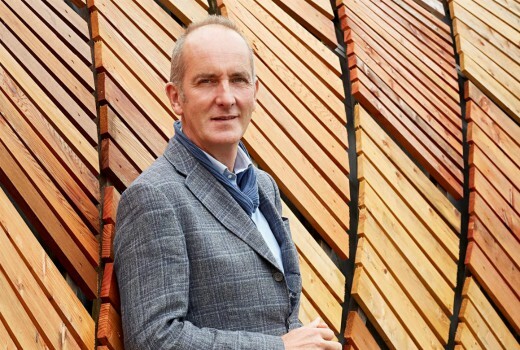 A new season of Grand Designs with Kevin McCloud begins on ABC later this month, kicking off with an ambitious upside-down, New Zealand-inspired hill house clinging to a steep slope. Coming this series is an innovative Tardis-like, space-saving home squeezed into a tiny corner of East London, a unique horseshoe-shaped retro courtyard house on the ancient grounds of an abbey in Hertfordshire, and a giant ground-breaking shed-inspired barn. This aired in the UK in September. After a four-year stint living in New Zealand, ex-RAF pilot Jon and GP Gill Flewers want to build a Kiwi-style hill house on the slopes of the Malvern Hills in Worcestershire. They plan to build an ambitious three-storey home clad in wood and stone, but the pair encounter problems right from the start as the site is so steep builders do not want to take on the job. So, Jon takes another massive gamble and, despite his complete lack of experience, he quits his job and decides to run this tricky project himself. It proves to be an emotional rollercoaster ride, with unexpected challenges, leaving Jon struggling to cope. 7:40pm Sunday February 25 on ABC.